I love when two things that are great on their own come together to make something even greater. Like peanut butter and chocolate, chips and salsa, champagne and orange juice. Am I right? And now, pumpkin spice and energy balls! Oh yes, a match made in heaven and just in time for the fall pumpkin season. 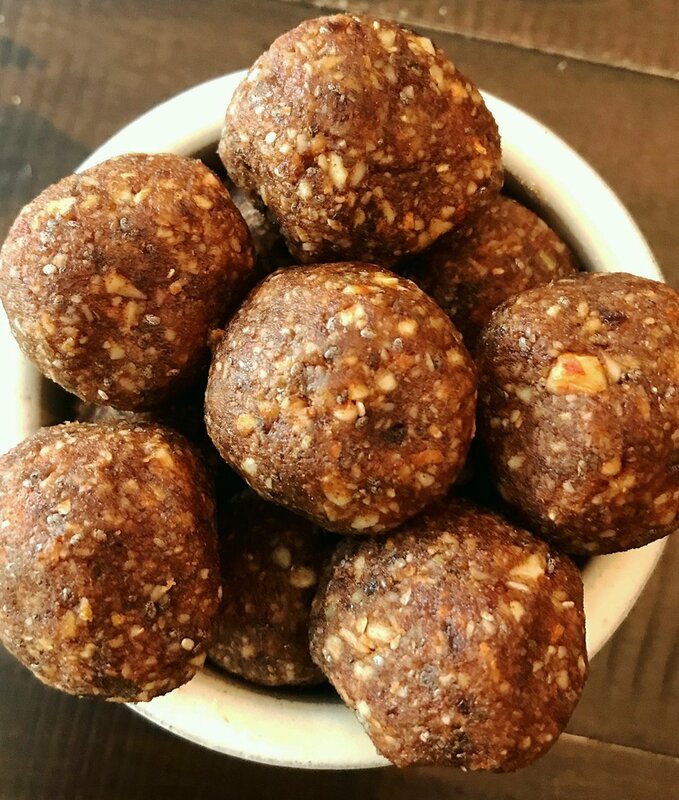 These healthy pumpkin spice energy balls are quick, easy and make a great snack or sweet treat. Pumpkin is the hot flavor right now, thanks to the #PSL trend and I’m getting right on that train. I can’t go anywhere without seeing a pumpkin flavored food or drink. And for good reason, really. All of the warm, delicious spices that come with pumpkin flavor like cinnamon, ginger, nutmeg and clove. I think those spices elicit a warm cozy feeling reminiscent of cold nights by the fire and family feasts at holidays. So, let’s talk more about pumpkin and the nutritional benefits because there are a few. I actually made these pumpkin spice energy balls by accident, which is probably how many great recipes are born. I was making the cinnamon energy balls, yet again, for another baseball tournament (for the boys between games when they have a double header) and saw some leftover pumpkin puree I used for a test recipe. It was going to be cold that night at the games and pumpkin sounded good so I made another batch, changed it up a bit and added the pumpkin. I didn’t have high hopes for them but they ended up being a big hit with the boys and the parents. These pumpkin spice energy balls can be totally customizable. You can use a different nut, add nut butter, add oats or oat flour in place of almond flour, use honey instead of maple syrup or leave the sweetener out, add collagen powder or use all cinnamon instead of pumpkin pie spice. I love when I’m able to customize a recipe to fit my dietary needs or taste preferences. Healthy, quick and easy pumpkin spice energy balls make a great snack or sweet treat. Add almonds, pepitas and dates to food processor. Pulse until you get small crumbles. Add the rest of the ingredients and pulse until well mixed. With wet hands, roll into balls. Place balls on parchment lined plate or baking sheet and refrigerate. Happy fall ya’ll! I hope you have a great fall season. I’m planning to enjoy the great weather we are having and get in all the essential activities like the pumpkin patch and apple orchard. And of course enjoy some pumpkin treats like these.